Deep in the rice paddies of the Mekong Delta, you can visit the bustling floating river market at Cai Be. The riverfront village is a major hub for the farmers, wholesalers and buyers who congregate here into a raft of produce-laden longtail boats, and the agricultural products bought and sold at this market are distributed throughout the country. Many vendors specialize in just a handful of fruits of vegetables, which they advertise with samples tied atop wooden poles. You can visit the market as part of a boat tour from nearby Vinh Long. Along the riverbank near the market, you can see a picturesque Catholic cathedral, and it’s worth exploring the village and strolling paths along the area’s numerous side canals. The boat ride from Vinh Long to the floating market takes about one hour, and you can visit farms and explore island and side branches of the river along the way. It’s a two-hour drive to Vinh Long from Ho Chi Minh City, and morning is the best time to visit the market. Experience local life on the Mekong River with this leisurely full-day cruise from Ho Chi Minh City. Glide along the scenic waterways in a motorboat and hop off to visit a brick kiln factory, cycle around An Binh Island and watch local artisans and craftsmen at work. After a tasty lunch of Vietnamese specialties, board a sampan and paddle through the colorful houseboats of the Cai Be Floating Market. End your day with a cup of honey tea or snake wine at the markets. Enhance your cultural experience of Vietnam on an enriching full-day excursion from Ho Chi Minh City to the rural countryside of the Cai Be. Accompanied by a knowledgeable guide, feast your senses on the enticing aromas of fruit orchards; tantalize your taste buds at a traditional candy factory; and browse stalls bursting with exotic produce during a visit to a floating market. Interact with locals as you uncover the secrets of Vietnamese cuisine and enjoy a bicycle ride around the town of Cai Be on this intimate small-group tour. Visiting the Mekong Delta on an independent day trip from Ho Chi Minh may mean you spend more time planning than actually experiencing the region. This full-day private trip lets you get the best from your day: by combining cycling and kayaking with opportunities to encounter local life. Paddle a kayak, cycle around orchards and farms to see and meet locals, and learn all about the delta from a guide. Trade city streets for shady canals on a full-day, small-group trip from Ho Chi Minh City to the Mekong Delta, where you’ll explore a fascinating maze of waterways by river boat and rowboat. Join the colorful crowd at a floating market, sample local specialties, then enjoy a local-style lunch in an island orchard, meeting Mekong Delta locals along the way. To ensure personal service from the guide, group size is limited to 15 people. Experience the timeless beauty of rural Vietnam on this private full-day tour of the Mekong Delta My Tho from Ho Chi Minh City, including hotel pick-up. Cruise along the waterways to the lively Mekong River; travel by sampan along the canals under the green canopy of water coconuts trees. Stop for a delicious home-cooked lunch at a local family home and help to catch your own fish, then set out on a scenic bike ride around the neighboring villages and farms. Discover the Mekong Delta without the hassle of bargaining on this convenient day trip. Cruise through the Cai Be Floating Market to Cuu Long village and learn how rice paper is made. Then board a sampan rowing boat to explore the narrow canals, stopping to try snacks, watch a Tai Tu music show, and visit a coconut mill. After lunch, enjoy a bike ride before your guide drops you back at your hotel. Combine two of Ho Chi Minh City’s most popular day trip destinations on this tour. Explore the fascinating Cu Chi Tunnels and learn how the network of underground tunnels, bunkers, and ammunition stores were used by the Viet Cong during the Vietnam War. After lunch, cruise around the scenic Mekong Delta on a traditional rowboat and experience local life in the rural villages and islands. Visit the famous floating markets of Cai Be on this incredible day trip from Ho Chi Minh City. Navigate the waterways with a local guide and learn about village life as you interact with residents of the water. Learn to cook local dishes, barter with locals and bike along rural paths through quiet villages on this tour that is sure to make memories. Cai Be floating market is one of the largest wholesale markets in the Southwest region. Many boats gather together and most of the bustling trading activities take place on the vast river. This lively scene makes Cai Be floating market an attractive tourist destination to tourists everywhere. Cruising along Cai Be floating market, you can see Tan Phong island which is composed of 6 beautiful islands with a total area of 2,430 ha. Tan Phong island is one of the famous islands in Mekong Delta and one of the famous eco-tourism attractions in Tien Giang province. Discover the floating markets, paddy fields and rural culture of the Mekong Delta on a full-day tour to Vinh Long and Cai Be from Ho Chi Minh City. Explore bustling rivers and quiet canals in a motorized riverboat and small rowboats, and get a glimpse of life at the water's edge. Travel through traditional delta villages and visit a countryside produce market that overflows with aromatic spices and fresh produce. Swap bustling Ho Chi Minh City for the rural canals of the Mekong Delta on this full-day excursion. Set off in the early morning with a knowledgeable guide who accompanies you to a floating market. You’ll ride a boat through the narrow canals, learn to prepare Vietnamese dishes in a cooking class and bicycle along village paths on Tan Phong Island. Numbers are limited to 12 people to ensure a small-group experience. Phu Quoc Island is known for white sand beaches and large parcels of undeveloped tropical jungle. From floating markets to 1860s resistance fighter heritage, your guide will show you the highlights of the lower Mekong Delta and this unique island. On this multi-day tour, you'll see a different side to Vietnam without the stress of travel planning: your itinerary, lunch and accomodation are taken care of. Get a taste of rural life in the Mekong Delta on a full-day tour from Ho Chi Minh City to Cai Be floating market, with a boat trip through delta canals, a bike ride on a river island, and visits to local farms and workshops. This Mekong Delta tour includes all activities, lunch, and hotel pickup and drop-off from Ho Chi Minh City. See the highlights of Vietnam on a comprehensive 10-day tour from south to north. Beginning in Ho Chi Minh City, see floating markets, the Cu Chi tunnel complex, My Son temples, the Temple of Literature, Hoan Kiem Lake, and much more. Experience both city and rural life and learn about Vietnam’s history along the journey. The tour ends in Hanoi. Weave your way through a patchwork of rice paddies, riverside villages and tranquil waterways on this 2-day Mekong Delta adventure from Ho Chi Minh City. Hop aboard a luxury speedboat, then switch to a xe loi to cruise around the villages, browse the famous Cai Be floating market and dine at floating restaurants. Along the way, get a glimpse of local life as you peek into artisan workshops, watch craftsmen at work and learn how to make rice noodles. This small-group tour includes overnight accommodation at The Island Lodge boutique hotel, meals and hotel transfers. Cruise among local boats in the Mekong Delta on this small-group day trip to Cai Be from Ho Chi Minh City. A 2-hour motorized boat ride includes Cai Be Floating Market. Witness daily life on the waterway and see how coconut candy and rice paper are made. Participate in a cooking lesson on an island and eat your creations for lunch before a sampan ride through the canals. Cruising the Mekong River is a quintessential Vietnamese experience and a multi-day tour offers extra time to soak up the scenery. On this 2-day cruise from Ho Chi Minh City, explore riverside villages of Cai Be, Tra On, and Can Tho, visit the atmospheric Cai Rang Floating Market, and enjoy overnight accommodation and meals on-board. Vietnam’s Mekong Delta, with its canals, orchards, and floating markets, lies within day-trip distance of Ho Chi Minh City, but is difficult to cover in a day independently. This full-day tour provides a hassle-free alternative, and encompasses many delta highlights, including a boat trip around Cai Be floating market, bike and rowboat rides, plus fruit orchard and coconut-candy workshop visits. Lunch and selected hotel pickup and drop-off are included. If you’re short on time in Ho Chi Minh City, and are looking to pack in as many sights as possible, opt for a stress-free day trip to Cai Be floating markets, Sa Dec town, and the Mekong River. Let a guide take care of transportation and navigation as you sit back, relax, and discover historical and cultural info integral to understanding Vietnam. Plus, traveling by three different modes of transport—boat, bike, and coach—provide different sightseeing perspectives. Cycling around the Mekong Delta without a guide may mean just skimming its sights and culture. This small-group 3-day tour from Ho Chi Minh offers a deeper dive: with guided bike rides, river cruises, food tastings, and visits to workshops, farms, and markets, all with guided commentary for a more enriching experience. A night in a homestay and a hotel, plus bikes, entry fees, and meals, are included. From your Ho Chi Minh City city hotel take an air-conditioned minivan to the Mekong Delta. You’ll spend about 3 hours at your destination and explore the Cai Be floating market by motorized boat. A bicycle ride, rowboat, fruit snacks lunch, and traditional music all add value to this guided day trip. Life happens on the water in the Mekong Delta, where villages are linked to floating markets by small canals. Get a personal introduction to the Mekong Delta culture and landscape on a full-day, private tour from Ho Chi Minh City to Cai Be floating market that includes a boat tour of the market and canals, lunch in a garden restaurant, and round-trip transport from your Ho Chi Minh City hotel. Explore the Mekong Delta's landscape, culture and history on this full-day tour from Ho Chi Minh City. 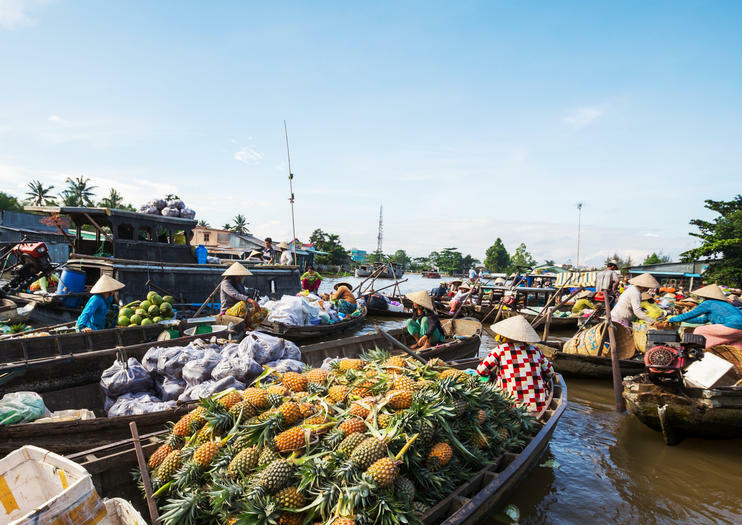 In Cai Be, visit the floating market and watch the locals trading fruit and other commodities. Wander into the small villages to visit the orchard and fruit plantation, accompanied by traditional southern Vietnamese folk music. On Tan Phong island, join to a cooking class and feast on your creations for lunch. Interact with locals and learn about life in the delta during a bicycle ride around town. Round-trip transportation from Ho Chi Minh City by coach and boat is included. Witness the daily activities of Cai Be Floating Market on a private day trip from Ho Chi Minh City. Board a boat at the famous floating market in the Mekong Delta, then meander into small villages and visit a fruit orchard. Cruise a network of canals to Vinh Long for a lunch of local specialties accompanied by folk music of southern Vietnam.